I don’t have any ideas on how Dominion might relate to the housing crisis yet, but I’m finding this book to be interesting in other ways. It is certainly a slow read; long and heavy. However, I do enjoy the language. It’s wonderful overall, but every so often there’s a moment when I pause and reread a piece of the language I especially like. It’s like finding little treasures scattered throughout the book. The end of Mr. Blandings Builds his Dream House filled me with a rage I did not anticipate. The Blandings’ maid Gussie ends up saving the day with a slogan for Mr. Blandings’ WHAM advertisement without knowing it, saying “If you ain’t eating WHAM, you ain’t eating ham!” The movie then ends with an advertisement of Gussie’s photo with her slogan under it. Thanks to Gussie’s work, Blandings is not fired and he and his family can continue to live out their American dream in their beautiful new home. I thought something really interesting about the beginning of “Dominion”, at least the parts that we read Tuesday, was that it reminded of the holiday Passover. I am not sure if I would have made the connection without Passover being on my mind right now because the holiday begins this Monday. For anyone who doesn’t know what Passover is; it is, in simplest terms, the story of how the Jewish people left Egypt after being an enslaved people for hundreds of years with the help of Moses and G-d.
Part of what made me think of this section as the story of Passover was when Jasper got rid of Ould Lowe by making him sink to the bottom of the body of water. For me this reminded me of the part of the Passover story where Moses, with G-d’s help, was able to split the sea and led the Jewish people away from the approaching Egyptian army. When the Jewish people were safely across Moses let the sea become one again, trapping the soldiers underneath the sea and killing them. When Jasper killed Ould Lowe he was able to truly start his new life, just like once the Egyptian soldiers were gone the Jewish people could begin their new lives for the first time without being an enslaved people. Beth invited me to “loop back” to the conclusion in my Dirge essay and unpack it more on the blog, so in this post I am both circling back to the Dirge essay, and circling with it, as I explore the Dirge as a navigational tool that true to its etymology, provides direction through the often non-navigable crises of grief and loss in general. I write that the root “direct” “suggests that [the dirge] is grounded in the struggle of navigating the “liminality” of loss in general – the intangible “state of betwixt-and-betweenness” as author Joseph Roach discusses in Cities of the Dead: Circum-Atlantic Performance (37).” I contend that considering the etymology of the word “dirge” and its roots in direction, our course may “feel like a dirge” in that it is often a somber commemoration to the loss that is associated with the housing crisis, but outside of that lament it is also our map to help us navigate the crisis and the concepts surrounding it. It’s funny to me how something can have slipped entirely out of your memory, and then the barest hint of anything related to it can pull the whole memory to the forefront of your mind. Property ownership has been an overarching theme of the semester thus far. From The Old Man and the Storm, which follows an eighty-two year old man as he rebuilds his home after Hurricane Katrina, to Michael Lewis’ The Big Short, which depicts the build-up of the United States housing bubble in the early 2000’s, to Angela Flournoy’s The Turner House, which tells an account of an African American family living in Detroit struggling to keep their childhood home, the concept of housing is an important element to consider. Furthermore, it is also crucial to keep in mind that in all three of these cases this notion of home is accompanied with sentiments of melancholy. The idea of a “dream house” juxtaposes the disheartening idea of home seen in the varying art forms aforementioned. This notion of a “dream house” is largely highlighted in mediums such as magazine advertisements and television shows and connects notably to the “American Dream” throughout time. Rather than focusing on compartmentalizing, many times a key component of a “dream house” is expansion, as depicted in Mr. Blandings Dream House. In the film (seen thus far), Jim Blandings and his family are cramped in a New York apartment. After seeing an ad in the paper about new homes in Connecticut, he and his wife decide to purchase what they continuously call their “dream house,” regardless of the apprehensions of their lawyer. However, Dr. Kenneth Cooper’s lecture “Small is Beautiful” highlights the importance of modesty and ecological efficiency. 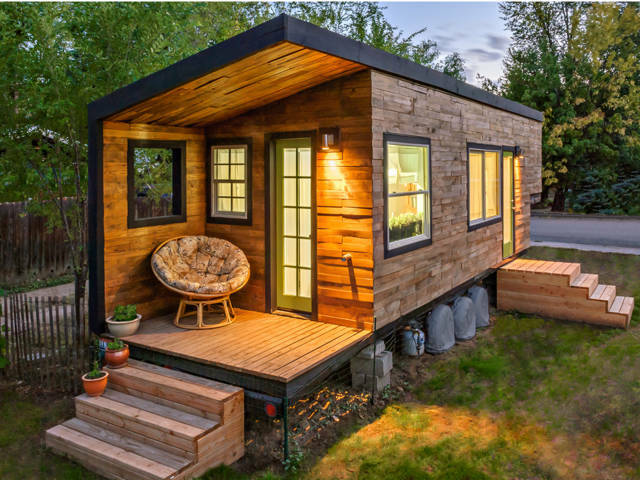 He calls attention to the contemporary “Tiny House Movement” gaining popularity, as magazines and television shows are beginning to bring this shift into popular culture. An excerpt from the the television show Portlandia, shown during the lecture, exemplifies, in a greatly exaggerated manner, the efficiency and capability of a “tiny house.” Dr. Kenneth Cooper went on to reexamine the notions of the “American Dream,” calling attention to other countries, such as the Netherlands, that use bicycles, drive smaller vehicles, have tinier food portion sizes, and overall have less grandiose ideals within the culture. This sense of more, and bigger and greater has me thinking, when did the “American Dream” begin to constitute gluttony? Or has it always had? Sarah Holsberg on What’s in a name? Kazon Robinson on What is Real Anymore?